Now you can nano-size the dinosaurs! With these micro-sized building blocks, this 3D model takes shape right beneath your fingertips. You'll be amazed as the Brachiosaurus skeleton is assembled to the tiniest detail. With over 290 assorted pieces, create a detailed replica of a Brachiosaurus skeleton that fits in the palm of your hand! 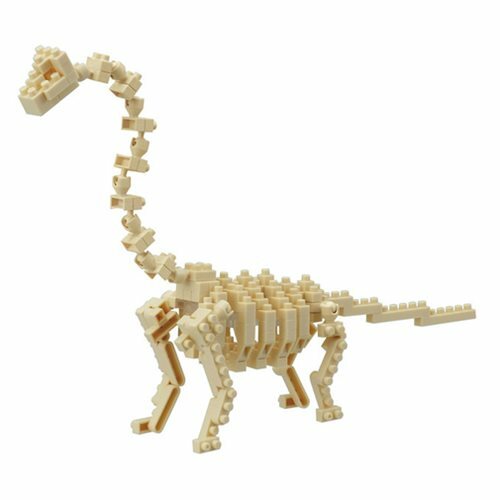 The Brachiosaurus Skeleton Nanoblock Constructible Figure's finished size is 8-inches long x 5-inches tall x 1 1/4-inches wide. Detailed color instructions included. Ages 8 and up. Level of difficulty: 4 (on a scale of 1 to 5, with 5 being the most difficult). First introduced into the Japanese market in 2008 by Kawada Co. Ltd, nanoblock is the original micro-sized building block. The smallest piece in the nanoblock construction set nanoverse measures a mere 5 mm x 4 mm x 4 mm! Challenging and fun for all the construction enthusiasts in the family, nanoblock building blocks and building sets let you build in greater detail than ever before. There are over 100 different sets to collect, for many skill levels.